This article will reduce the cook time of your meals by minutes. Lots of engineering to explain WHY, but I will be sure to bold the tips on how to implement ways to cook food quicker. 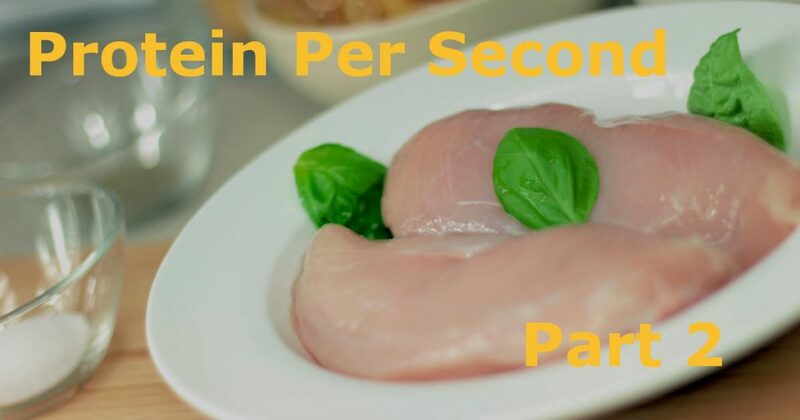 This uses Chicken for most studies, but this can be replaced with any other meat protein. This data is ‘Out Of Control‘. Which means, the data isn’t significant. The data I post on this site is the highest mathematical quality I can possibly create, and I will not post bad data. I will include the Protein Per Second, however I won’t post it in an Excel file format like I usually do. Science would isolate this problem and find that throwing a few thousand pounds of chicken into Lava would be the fastest way. Engineering has to make this problem applicable. Grills, Stove Boiling, Stove Sauteing/Searing, and Slow Cookers are examined. Methodology for all of these is common. Prep to Clean. Writing down process is something we do in Industrial Engineering. Clean pan immediately under hot water to reduce sticking. This can be done faster or slower depending on how you like your eggs cooked. I did this with 4 eggs with the goal of over medium-hard eggs. 27g protein, 4 minutes. Eggs were cooked in a similar way. Warming up sausages and toasting bread to make taste optimal added an extra 2 minutes in prep time. This included taking out 1 extra pan, 1 extra lid, opening and closing the freezer 2 times, and taking out an extra appliance. The biggest thing to note- Sausages will cook in a similar time regardless if you have 2 or 10. To understand why, I drew a picture that brought me back to our dreaded ME331 Fluids and Heat Transfer. 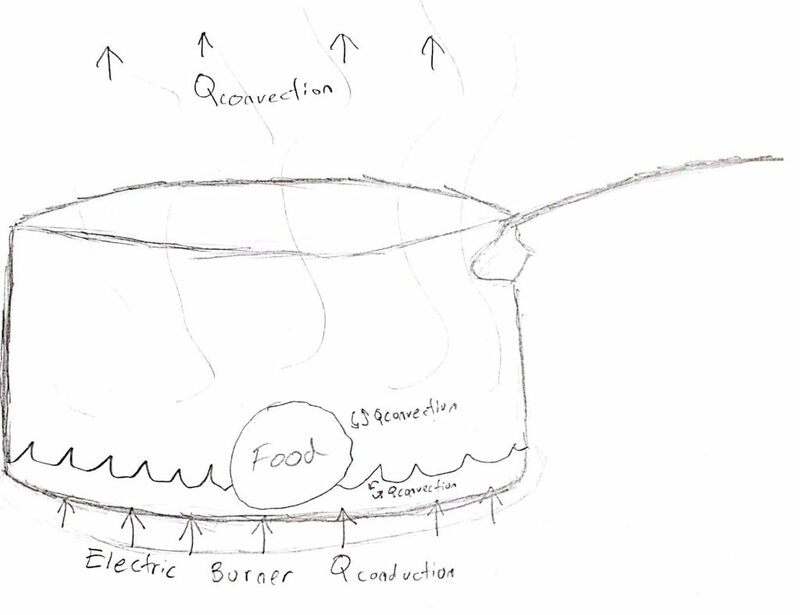 The heat from Electric Burner to Pan is a Heat Conduction(Qconduction). 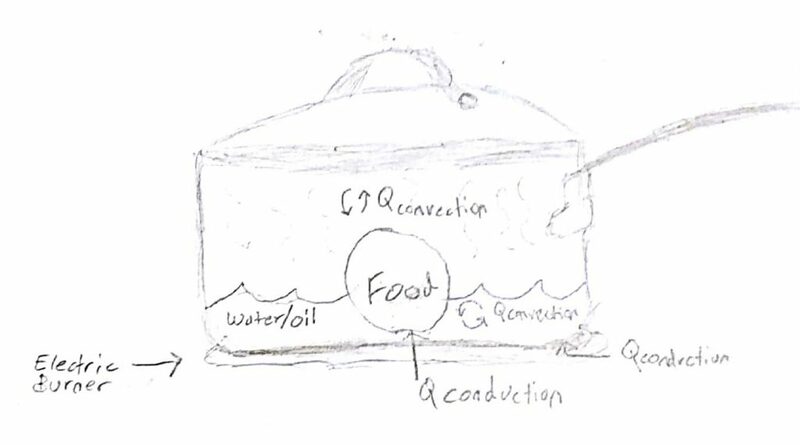 Conduction is Contact-To-Contact. Meaning surfaces need to touch completely. The browning of meats require Conduction and absence of water(we will get to that later). Protein touching the surface of the pan is getting more heat than protein that isnt touching the surface. The air inside the pan is moving heat through Convection(Qconvection). Convection is the air and liquid flowing next to the protein. When you point a fan at you, there is no surface to surface contact, but the air will brush your skin and reduce your temperature. Convection is especially strong with liquids, which we are going to see further in Boiling. Cooking food with a lid ON will cook faster. Cooking food with a lid OFF will cook slower, but will brown your meat quicker. 781g of chicken, cooked in 8 minutes and 15 seconds. Barely brown. 242g protein makes this 0.49 g Protein Per Second. Similar mentality as above, adding a lid will speed up the cooking process. Cooked on Medium High heat. Calling it ugly because there is no browning. The Mailliard Reaction when the lid is on. Any moisture kills the browning that gives chicken flavor. 14 minutes for 1041g chicken. 312g protein and .37g Protein Per Second. This is some beautiful cooking. Searing both sides of chicken for a near perfect Maillard Reaction. Adding a little vinegar to dissolve the brown Maillard bits stuck to the pan. Adding fajita seasoning and stirring. Quality comes at a time price. Despite having massive amounts of convection because boiling water is surrounding chicken, water has a high heat capacity. Instead of cooking the chicken, the heat from the burner is being transferred to the water. 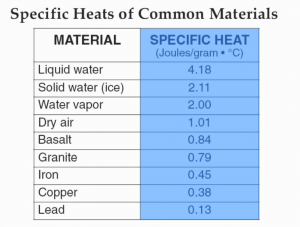 Below is a table for specific heats of materials. Water has a high specific heat, water is more dense than air, and there is significantly more mass to heat up than the same volume of air. However… once the water is boiling, water is a better conductor of heat. The most optimal way to boil chicken is to start the water, do something else, come back and drop the chicken in. There will be no mallard reaction, but very quickly chicken will be cooked. Tip: Use the least amount of water you can get away with. Oil is also a very popular medium of heat transfer because oil does not boil and can get hotter than water. If you are going to use oil for frying chicken, take note that at high temperatures, low smoke point oils will begin to smoke and catch fire. While this technically takes almost 4 hours, this is a favorite because most of this time is inactive. I am considering how to study this given the amount of meat depends on the slow cooker(and who really wants 5lbs of the same meal?). Here are two recipes that take less than 4 minutes to make. After 4 hours on high or 6 hours low, the chicken can be shredded and topped with BBQ sauce and placed on a bun or eaten plain. Here is the recipe, takes a tiny bit longer because there are more ingredients and I suggest cooking rice + veggies. However this is a lazy favorite. Cut the fat off and butterflied 1.5 pallets of chicken. 15 minutes in the oven at 350F. This is potentially misleading because most people arent eating 1500g of chicken out of the oven. It also negates the time in the oven, similar to slow cooker chicken dishes. This was further packaged for later use. The biggest takeaway: cooking in bulk pays off significantly. It should be noted that both Ugly Lid On Chicken and Mass Produced Baked Chicken do not produce the Maillard Reaction. 28g protein including milk in 1 minute flat. This actually surprised me, I thought a protein shake would crush all competition. It seems that bulk production of food beats the competition. Cooking food at a single time reduces the prep and clean up time. Prep and Cleanup is a significant use of time on many proteins and I will continue to look to optimize further. An ultimate study of Protein Per Second, including fast food, street vendors, store rotisserie chicken and more is in the works. However different methods of home prep are going to be practically useful. Tip- If you want to save time on any process, apply metrics to it and study each step. Your home chores will become more enjoyable and completed quicker.